Stumbled upon these great old walkbridge lights while trying in vain to take a decent, centered shot of the many old cast iron lampposts still deployed around the Manhattan entrance to the Brooklyn Battery Tunnel, at the foot of Lower Manhattan. These post war late 1940s lampposts were clearly designed to mark the then new jet age, with the forward look that would gather steam as the 1950s wore on, culminating in the iconic Boeing 707's tail rudder needle. In contrast to the modern, davit style look of the poles was the already dated, pendant style luminaires hung from them. Within New York City by the end of the 1940s, and in parts of Long Island as well, the various pre war Gumball style lamps were being edged out by the new incandescent pendant fixture rock star, the Westinghouse AK10 Cuplight. 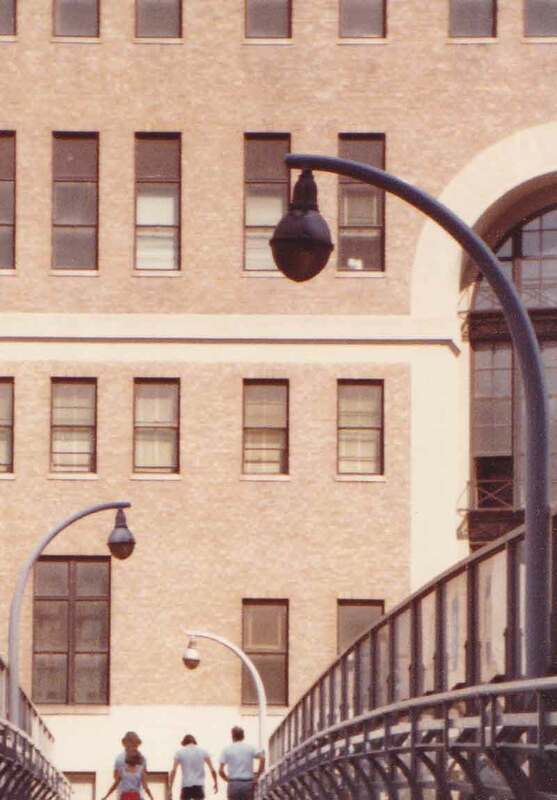 The tunnel authority must have installed these walkbridge lights for the Gumballs to have been chosen, for I doubt any more of that type were ever installed on regular New York City poles by then.